Pancor first popped up on the crowdfunding scene two years ago with their inaugural project, the Pancor P01—an aviation inspired meca-quartz chronograph that surpassed its funding goal. 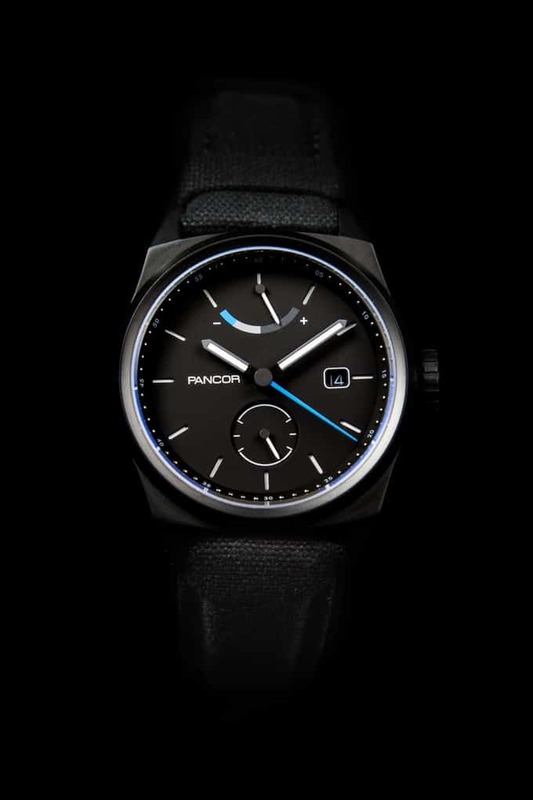 Now, Pancor has returned to Kickstarter with their second watch, the Pancor P02. The custom 316L stainless steel case measures 42mm wide, 50mm lug-to-lug, and 12mm thick; it’s a size that seems to be right in the middle of “small” and “big” in an attempt to appeal to a larger range of potential customers, especially with the 50mm lug-to-lug being relatively versatile. The case features a sapphire crystal and 100 meters of water resistance, and the display back shows the Miyota 9132 caliber (more on that in just a moment). Additionally, the back will carry the watch’s serial number. The styling of the case is somewhat familiar, taking after similarly cushion-cased military watches of years past. The case will be available in two versions: a fully-polished finish and a black PVD finish. Both variants of the P02. The criteria for the movement was that it had to be an automatic caliber with the ability to hand-wind. It also had to have a power reserve indicator and hacking seconds. With cost in mind, Pancor opted for the Miyota 9132. The 9132 also offers 40 hours of power reserve and a beat rate of 28,800 vph. There’s also a date and a 24-hour sub-dial. With the P02, the team behind Pancor wanted to create something original and versatile—a watch that isn’t a diver or aviation-inspired and one that could be worn daily. To that end, the P02 incorporates the movement’s features into a modern graphic design. The dials feature a muted color palette and simple markings to provide a clean look, and the sandwich construction gives it a bit of depth with the cut-out hour markers being filled with Super-LumiNova. Adding to the aforementioned dimensionality of the dial is the dramatic chapter ring, which has raised dots at every second except for intervals of five. The power reserve indicator is located at 12 o’clock with a segmented bar providing an additional touch of color. The 24-hour sub-dial is located at six o’clock and will have a different final design than the one shown on the prototypes here (scroll through the images below to see the final iteration). As for the dial colors, the PVD version, simply dubbed “Black,” comes with a matte, dark-grey finish (and features BGW9 Super-LumiNova), and the polished stainless version—here called “Green”—comes with a uncommon mint-green dial with C3 Super-LumiNova. The final version. Note the few differences with the date window and the sub-dial. The P02 is planned to be a limited release with a total of 400 watches produced with no restock at a later date. The PVD version should come on a black, padded nylon strap, while the green comes on a light grey tweed strap. The Pancor P02 campaign runs until November 24th, 2018 and as of this writing the campaign is about $10,000 away from its goal. The “super early bird” at $293 is gone, but the next level at $317 has plenty of available spots. The estimated delivery for the P02 is April, 2018. To learn more about the watch and to back the campaign, click here.